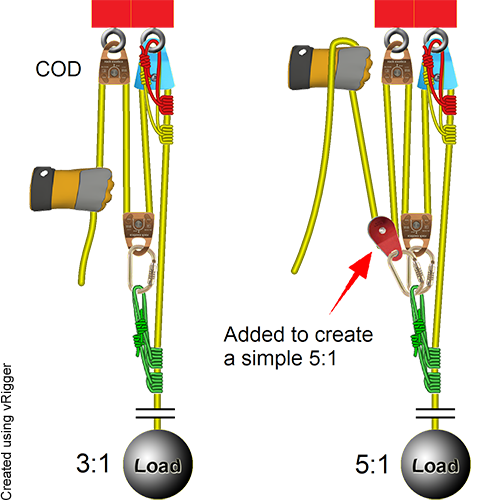 Five-to-one mechanical advantage systems can be rigged as either simple or complex systems. The first two illustrations on this page show how to rig both varieties. The second two illustrations show how you can convert 3:1 systems to 5:1 systems. This is handy if you rig a 3:1 and don't quite have enough pulling power. The final illustration on this page shows how to rig a 5:1 as a reeving system. The downside of systems with a 5:1 or higher mechanical advantage is you have to pull a lot of rope to move the load a short distance. Even if you only need to raise a load 20 feet using a 5:1, you will have to pull a whopping 100 feet of rope (and probably reset the system many times). Maybe this isn't simple to remember, but this illustration shows the basic layout of a simple 5:1 system. 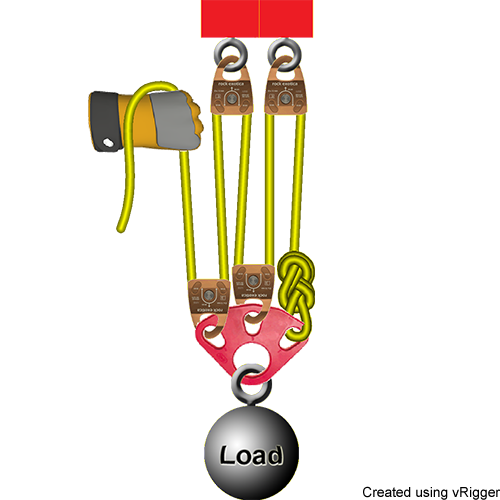 Remember that in "odd" numbered systems (e.g., 1:1, 3:1, 5:1, etc) the end of the rope is connected to the load, as shown in this 5:1 system. As with this system, complex systems usually have at least one pulley moving in the opposite direction of the load. 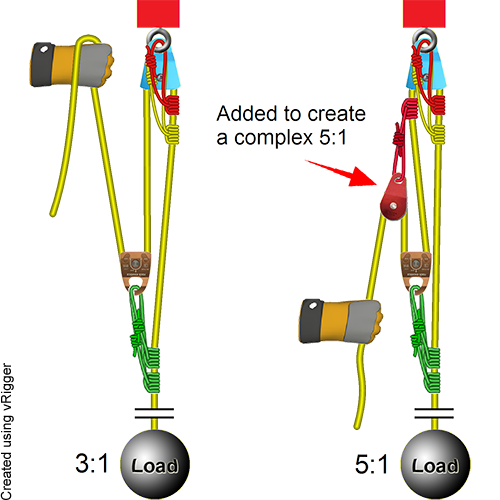 If you already have a 3:1 system with a COD pulley, you can create a simple 5:1 system by adding one more pulley at the load (the red pulley in this illustration). This is a handy trick when you need a little more mechanical advantage (although you may also need to add another COD pulley to retain your direction of pull). And if you move that red pulley to just above the gold pulley (as shown here), you can create a compound 9:1. You can change a 3:1 system to a complex 5:1, with its inherent complexities, by adding a Prusik and a pulley near the anchor. The term "reeving" refers to threading a rope through other items. 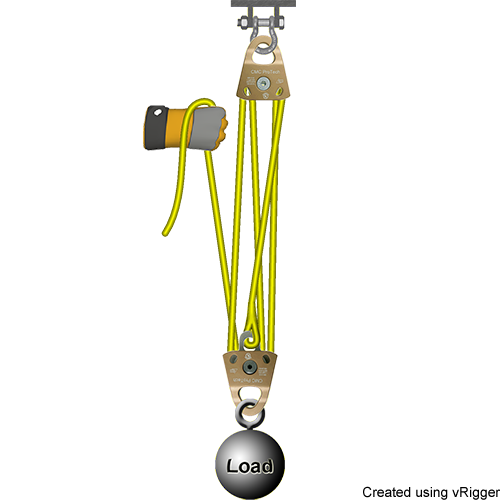 This example shows how to create a 5:1 reeving system using two double-sheave pulleys (one of which has a becket—the small tab on the pulley). Despite the visual complexity, this is a "simple" mechanical advantage system.